The amusement parks which first appeared in England at the turn of the twentieth century represent a startlingly novel and complex phenomenon, combining fantasy architecture, new technology, ersatz danger, spectacle and consumption in a new mass experience. Though drawing on a diverse range of existing leisure practices, the particular entertainment formula they offered marked a radical departure in terms of visual, experiential and cultural meanings. The huge, socially mixed crowds that flocked to the new parks did so purely in the pursuit of pleasure, which the amusement parks commodified in exhilarating new guises. Between 1906 and 1939, nearly 40 major amusement parks operated across Britain. By the outbreak of the Second World War, millions of people visited these sites each year. The amusement park had become a defining element in the architectural psychological pleasurescape of Britain. 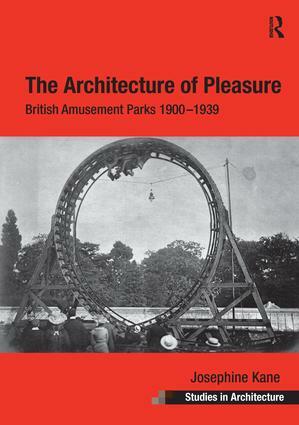 This book considers the relationship between popular modernity, pleasure and the amusement park landscape in Britain from 1900-1939. It argues that the amusement parks were understood as a new and distinct expression of modern times which redefined the concept of public pleasure for mass audiences. Focusing on three sites - Blackpool Pleasure Beach, Dreamland in Margate and Southend's Kursaal - the book contextualises their development with references to the wider amusement park world. The meanings of these sites are explored through a detailed examination of the spatial and architectural form taken by rides and other buildings. The rollercoaster - a defining symbol of the amusement park - is given particular focus, as is the extent to which discourses of class, gender and national identity were expressed through the design of these parks. Contents: Introduction; A fortune in a thrill: the rise of the amusement park 1900-1920; A whirl of wonders! Technology, machine bodies and moving images; A great fun city: crowds, space and time; Putting order into chaos: the amusement park 1920-1939; Shifting modernities: pleasure and leisure at the amusement park; Conclusion: modern pleasures; Bibliography; Index.